As you investigate your options for hair restoration, there are three considerations that you’ll keep coming back to: pain level, scarring/noticeability, and lasting effect. There are plenty of answers to be found on the internet, but this is our take on hair restoration surgery using Follicular Unit Extraction. Hair restoration is performed under a local anesthetic, so there is very little pain, and only mild discomfort if any at all. There may be some slight soreness after the anesthetic wears off, but most patients don’t experience anything that a couple of ibuprofen can’t relieve. You will likely be very pleasantly surprised at the lack of discomfort! 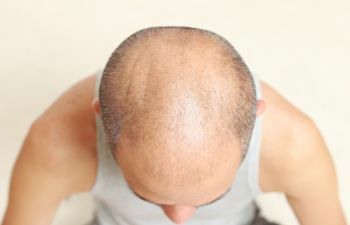 The one thing most hair restoration patients don’t want is to look like they are trying to hide or otherwise mend their hairline. At Kalos Hair Transplant, creating a natural look is one of Dr. Stong’s top goals with every patient. Initially, there will be some redness both in the area the follicles were extracted from and where they were placed. The redness diminishes in a few days and your hairline will begin to look more natural. The full results won’t come immediately, but after 6-12 months, the hair in the transplanted areas should look more full and natural. While there is a physiological element that you can’t control, it mostly depends on you. If you are gentle with your new hair and scalp, there’s no reason to believe the graft won’t last! When you’re ready to get your hair back, call Kalos Hair Transplant for a consultation.